This species was originally described in 1885 by French zoologist Léon Vaillant, who proposed it as the species Testudo yniphora based on the distinguished shape of the anterior part of the plastron. 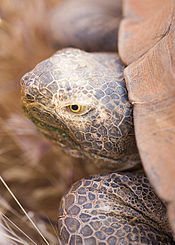 The angonoka tortoise (A. yniphora) and the radiated tortoise (A. radiata) are the only species in the genus Astrochelys. Astrochelys is attributed to John Edward Gray, who used the name in his 1873 book Hand-list of the specimens of shield reptiles in the British Museum. The parent family for Astrochelys is Testudinidae, the tortoise family. The name angonoka comes from the Malagasy word used as the local name of the species. The alternative common name, ploughshare tortoise, refers to the appearance of the gular scute of the plastron. The carapace is highly domed and light brown in colour with prominent growth rings on each scute. The outer parts of the vertebral are a darker brown. The gular scute of the plastron projects forward between the front legs and curves upward toward the neck. Males are larger than females, reaching a carapace length up to 17 in (43 cm). The average length of an adult male angonoka tortoise is 414.8 mm (16.33 in) and the average weight is 10.3 kg (23 lb). Females measure at a 370.1 mm (14.57 in) average and weigh 8.8 kg (19 lb) on average. In the wild, this species is only found in Madagascar, where it is endemic to the dry forests in the Baly Bay area of northwestern Madagascar, near the town of Soalala (including Baie de Baly National Park). The distribution is 25 to 60 km2 (9.7 to 23.2 sq mi) in range around Baly Bay. The Baly Bay region is made up of savanna, mangrove swamps, and dry deciduous forest. They make use of bamboo-scrub habitat which is made up of different types of shrubs, savanna grasses, bamboo, and open areas with no vegetation. The flora includes shrubbery usually under 2 m (6 ft 7 in) in height, such as Bauhinia and Terminalia species, and Perrierbambus madagascariensis bamboo, which forms dense thickets. The elevation of this area is under 50 m (160 ft) above sea level. The angonoka tortoise has been observed feeding on grasses found in open rocky areas of bamboo scrub. It is also known to eat shrubs, forbs, and herbs. While it has been seen eating dead bamboo leaves, it has never been observed eating living bamboo. As well as these plants, the tortoise has also been seen eating the dried feces of bushpigs and carnivores. The introduced bushpig is the main predator of the angonoka tortoise; it eats the tortoises' eggs and young. It is expected to become sexually mature once reaching 15 years old. The tortoise can produce one to six eggs per clutch and up to four clutches every season. The reproductive season is from January 15 to May 30. The angonoka tortoise's reproductive patterns coincide with the seasonal rainfall patterns of the region, with both mating and hatching occurring at the onset of the rainy seasons. With a 71.9% fertility rate and a 54.6% hatching success rate, about 4.3 hatchlings are produced per female tortoise. In captivity, males must be separated due to aggression towards each other, including ramming, pushing, and overturning with the enlarged gular scute. The aggression is used to establish dominance. Angonoka tortoise bred in captivity in the Ivato Croc Farm, Antananarivo. This species is one of the rarest land tortoises in the world, classified as Critically Endangered on the IUCN Red List. The principal threats to the species are believed to be fires started to clear land for cattle grazing, and collection for the pet trade. The tortoise has a restricted distribution, likely a result of past collection for food, the expansion of agriculture, and accompanying fires. An additional threat is predation by the bushpig. Fires made to clear land can get out of control, turning into wildfires, which cut back more of the angonoka tortoise's habitat. Following efforts to create firebreaks through controlled fires in savanna fringes by conservation groups, out-of-control fires have decreased, until less than 50 ha (120 acres) of its habitat were burnt in 2004. Another reason why the Angonoka might go extinct is that the species is concentrated only in one area. They are not dispersed, which means anything such as severe weather and disease could wipe the species out. The angonoka tortoise is often captured to be sold in the international pet trade. Though some enforcement of restrictions on illegal trade is successful, including the confiscation of the illegally obtained tortoises, they remain in incredibly high demand for the global pet trade. This is a major threat to the tortoises remaining in the wild. Conservationists mark the shells with identifying marks which mars the most attractive feature and make them less desirable to poachers and wealthy collectors. The engraving is a last-ditch effort to protect the animals. In addition to its Red List listing, the angonoka tortoise is now protected under the national law of Madagascar and listed on CITES Appendix I, commercial trade in wild-caught specimens is illegal (permitted only in exceptional licensed circumstances). For the conservation of the angonoka tortoise, the Durrell Wildlife Conservation Trust created Project Angonoka in 1986. The Water and Forests Department, the Durrell Trust, and the World Wide Fund for Nature work together on this project. A captive-breeding facility was established for this species in Madagascar in 1986 by the Jersey Wildlife Preservation Trust (now the Durrell Trust) in collaboration with the Water and Forests Department. In May 1996, 75 tortoises were stolen from the facility. The thieves were never found, but 33 tortoises later appeared for sale in the Netherlands. The project ultimately was a success, achieving 224 captive-bred juveniles out of 17 adults in December 2004. After the 1990s, Project Angonoka started ecological research on the tortoise and the development of conservation plans that involved the communities surrounding the habitat. The work with the community involved local people in making firebreaks, along with the creation of a park proposed by the community to protect the tortoise and the forests. Monitoring of the angonoka tortoise in the global pet trade has continued to be advocated. In March 2013, smugglers were arrested after carrying a single bag containing 54 angonoka tortoises and 21 radiated tortoises (Astrochelys radiata) through Suvarnabhumi International Airport in Thailand. The 54 angonoka tortoises might be as much as a tenth of the world's population of the species. On 20 March 2016, the Custom officials at Mumbai airport seized 146 tortoises from a mishandled baggage of a Nepal citizen. This bag was said to belong to a transit passenger, who arrived from Madagascar and flew to Kathmandu leaving this bag behind. Out of the 146 tortoises, 139 were radiated tortoises (Astrochelys radiata) and seven were angonoka tortoises (Astrochelys yniphora), both critically endangered tortoise species of Madagascar. Two radiated tortoises were found dead with broken shell. On 12 June 2016, it was reported that 6 angonoka tortoises and 72 radiated tortoises had gone missing from a breeding facility in Thailand. ^ a b c d e f g h i j k l m n o Leuteritz, T.; Pedrono, M. (2008). "Astrochelys yniphora". The IUCN Red List of Threatened Species. IUCN. 2008: e.T9016A12950950. doi:10.2305/IUCN.UK.2008.RLTS.T9016A12950950.en. Retrieved 13 January 2018. ^ a b c Rhodin et al. 2010, p. 000.116. ^ Fritz & Havaš 2007, p. 268. ^ Fritz, U.; Bininda-Emonds, O. R. P. (3 July 2007). "When genes meet nomenclature: Tortoise phylogeny and the shifting generic concepts of Testudo and Geochelone". Zoology. Elsevier. 110 (4): 298–307. doi:10.1016/j.zool.2007.02.003. PMID 17611092. ^ Vaillant, L. (1885). "Comptes rendus hebdomadaires des séances de l'Académie des Sciences" (in French). 101. Paris: French Academy of Sciences: 440–441. Retrieved 29 October 2011. je proposerai de la designer sous le nom de Tesudo yniphora, faisant allusion a la forme speciale de la partie anterieure du plastron. ^ Fritz & Havaš 2007, p. 267. ^ Gray, John Edward (1873). Hand-list of the specimens of shield reptiles in the British Museum. London. p. 4. ^ Uetz, P.; Jirí Hošek, eds. (8 Jan 2014). "Astrochelys yniphora (VAILLANT, 1885)". The Reptile Database. Retrieved 6 February 2014. ^ Durbina, Joanna; Rajafetraa, Veloson; Reida, Don; Razandrizanakanirinaa, Daurette (1996). "Local people and Project Angonoka – conservation of the ploughshare tortoise in north-western Madagascar". Oryx. Fauna and Flora International. 30 (2): 113–120. doi:10.1017/S0030605300021499. a characteristic gular projection from the front of the plaston, whence derived the name 'ploughshare tortoise'. ^ a b Ernst, C.H. ; Altenburg, R.G.M. ; Barbour, R.W. "Geochelone yniphora". Turtles of the World. National Node of the Global Biodiversity Information Facility. Retrieved 31 October 2011. ^ "Angonoka Tortoise". Honolulu Zoo. Archived from the original on 6 April 2012. Retrieved 6 February 2014. ^ a b Juvik, J.O. ; Meier, D.E. ; McKeown, S. (1991). "Captive Husbandry and Conservation of the Madagascar Ploughshare Tortoise, Geochelone yniphora". Proceedings of the First International Symposium on Turtles & Tortoises: Conservation and Captive Husbandry. Archived from the original on 9 January 2011. Retrieved 29 December 2010. ^ Clement, S.; Reid, D.; Robert, B.; Joby, M.; Smith, L. L. (November 1999). "Status and distribution of the angonoka tortoise (Geochelone yniphora) of western Madagascar". Biological Conservation. 91 (1): 23–33. doi:10.1016/S0006-3207(99)00044-0. ^ a b "Ploughshare tortoise (Astrochelys yniphora)". ARKive. Archived from the original on 2012-01-01. Retrieved January 9, 2012. ^ Leuteritz, Thomas E. J.; Ravolanaivo, Rollande (2005). "Reproductive Ecology and Egg Production of the Radiated Tortoise (Geochelone radiata) in Southern Madagascar". African Zoology. 40: 233–242. Archived from the original (PDF) on 2012-04-26. ^ Defacing the world's rarest tortoises. BBC Nature. ^ Hutchings, Claire (1999). "Red Eye At Night". Geographical. Campion Interactive Publishing. 71 (3): 34. Nilsson, G. (1983). Endangered Species Handbook. Animal Welfare Institute. Rhodin, Anders G.J. ; van Dijk, Peter Paul; Inverson, John B.; Shaffer, H. Bradley (14 December 2010). "Turtles of the world, 2010 update: Annotated checklist of taxonomy, synonymy, distribution and conservation status" (PDF). Chelonian research monographs. 5: 000.89–000.138. Archived (PDF) from the original on 15 December 2010. Retrieved 28 October 2011. Fritz, Uwe; Havaš, Peter (2007). "Checklist of Chelonians of the World" (PDF). Vertebrate Zoology. 57 (2): 149–368. Archived from the original (PDF) on 17 December 2010. Retrieved 28 October 2011. This page was last edited on 20 April 2019, at 16:20 (UTC).